My first encounter with Reiki was in 1979, while on a tour of South East Asia. It has been a part of my life ever since, helping me through a serious illness and guiding me to ultimately become a Reiki Practitioner/Master and teacher of those interested in improving their health. I began instructing private Reiki courses in 2002, and was an Associate Instructor with Continuing Education Services teaching Reiki courses at SIAST Kelsey Campus in Saskatoon from 2003 to 2014. Recently SIAST has become a Polytechnic Institution and in accordance with this designation community courses (including Reiki Training) are no longer being offered through SIAST. At first this change intimidated me a little bit – SIAST has been my teaching-home for so many years! – BUT little did I know how many new doors this change would open! Firstly, it has enabled me to broaden the offerings of my Reiki Training classes in and around Saskatoon. I now have the opportunity to hold smaller, more intimate classes at my Duchess Street location. I am also pleased to announce a new Reiki Level I course through Carlton Trail College in Watrous (please find the details of these classes here). I have been involved in many aspects of Reiki research since 1997 when I co-authored a paper on the history and trends of Reiki in Saskatchewan. Throughout 1997 and 1998 I was involved in research on Reiki's effects on breast cancer patients. The research successfully demonstrated that Reiki could offset the side effects from chemotherapy and radiation. In 1999 I participated in a Health Transition Fund research initiative funded by Health Canada. 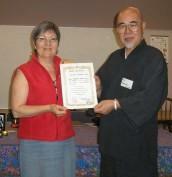 I was the Principle Reiki Practitioner. Within this initiative the guidelines were safety, empowerment, and feminine support through the collective approach. Over a six-month period I experienced the intricate play between safety, empowerment and self healing. I witnessed miracle after miracle as the effects of self empowerment, awareness of balance, and harmony became part of each client's life. This was a truly unique experience. This experience has become the foundation of my understanding of how Reiki works. Through my different roles in Reiki research projects I have learned that Reiki empowers people to do their own healing. Reiki helps people detect and alleviate problems of energy flow on the physical, emotional and spiritual level as well as relieving stress and pain. I am extremely privileged to be a part of this process. Following my work with the Health Transition Fund research initiative I became a Complimentary Alternative Medicine (CAM) Practitioner with the University of Saskatchewan College of Medicine. Exposure to Integrative Medicine has greatly widened my perspective of the role that Reiki can play in healthcare. Your body is already designed to clear and clean itself (it is like a self-cleaning oven!) Reiki supports your body's ability to do this through deep relaxation, resulting in reduced levels of stress. I am here to facilitate the energy of Reiki to support you throughout this healing process. As a practitioner, my job is to let the energy flow then get out of the way to let healing happen!